11 Now I saw another beast of prey coming up out of the land, and he had two horns like a lamb and spoke like a dragon. 12 And he exercises all the authority of the first Beast in his presence; and he started to cause the earth and those who dwell in it to worship the first Beast, whose mortal wound was healed. 13 And he performs great signs, including that fire should come down from heaven upon the earth before the people. 14 And he deceives my own people, those dwelling on the earth, by the signs that it was given to him to perform before the Beast, telling those who dwell on the earth to make an image to the Beast who had the sword wound and lived. 15 And it was granted to him to give breath to the image of the Beast, so that the image of the Beast should actually speak, and should cause as many as would not worship the image of the Beast to be killed. 16 And he causes everyone—both small and great, both rich and poor, both free and slave—to receive marks on their right hand or on their foreheads, 17 so that no one would be able to buy or sell who does not have the mark, the name of the Beast or the number of his name. 18 Here is wisdom: let the one who has understanding calculate the number of the Beast, for it is the number of man—his number is 666. A couple of people have suggested to me that I let you know upfront what my conclusion will be before I demonstrate that the conclusion is true. Great suggestion. It's actually an elementary principle of speaking, so I will definitely do that. Secondly, it has been suggested that I relegate some of the finer points of debate to the website. That is also a great suggestion because too much detail loses people. But it is a tricky balance to know how much to leave out. The website is going to be a growing repository of additional materials. So if you want to dig deeper into these things, go to the website. So let me tell you in two minutes who this beast from the land is. Many people treat this beast quite differently from the previous beast. But they shouldn't. When you have two symbolic beasts with heads and horns symbolizing something, there ought to be some similarity between those symbols - especially since the Greek word for "another" in "another beast" is the Greek word for another of the same kind, not another of a different kind. And that is the way I take it. Just as the first beast was primarily a demon and secondarily a kingdom and the current ruler, you would expect this beast to be demon who is behind a kingdom and a ruler. And it is. So what is the visible kingdom and ruler? The beast from the land is the new form of Israel that emerged in AD 70 and after. The head of the beast is a political ruler, Herod Agrippa II, whom I will just refer to as Agrippa for short. And just as the horns of the first beast were demons controlling leaders in the Roman empire, the two horns of this land beast are two demons who control the only two other leaders that remained after Jerusalem was destroyed - Josephus and Rabbi Yohannan ben Zakkai. So between the head and the two horns you have the entire leadership of post-AD-70-Israel. The head is the political leadership of Agrippa and the two horns are the religious leadership of the two most influential Pharisees who survived. Those two framed what we think of now as modern rabbinic Judaism. Yohannan especially is credited with being the most important rabbi in modern Judaism since he single handedly gave us what we now know to be Talmudism, a demonic religion that has created havoc in the last 2000 years. It purports to be a lamb (to be biblical) but it has the breath of the dragon written all over it. It is occult through and through. As promised, I won't go through twenty different theories and systematically eliminate each one. I am working on a spreadsheet and a paper that does that. But I think going through this verse by verse should be sufficient to make it clear. And the very first word hints at a time connection to the previous section. It is the Greek word 'kai' or 'and.' Pickering translates it as "Now" as if it is a throwaway "and" in the Greek. But grammarians who have studied the book of Revelation have proved that John uses Hebrew constructions and rules of grammar quite frequently, including what is known as the "waw consecutive." The waw consecutive is simply the use of the Hebrew word for "and" (or waw) to show that this is going to be next chronologically. So the New King James is probably more accurate when it translates this as "Then." At a very minimum, this should not be taken as being utterly unconnected to the previous section. If verse 5 says that Titus was authorized to fight for another forty-two months, and if that authorization came in AD 70 (which we saw that it did), then it is likely that the timing of these verses is probably going to start around AD 70. Just from the flow of the text, that is what we would expect. This is confirmed by verse 12 ("in his presence"), verse 14 ("in the sight of the beast"), and verse 16 (the mark being worn). And this is confirmed by several verses in this section. And bear with me - these are details I cannot relegate to the web. I'll just quickly read three of the verses. Notice in verse 12: "And he exercises all the authority of the first Beast in his presence; and he started to cause the earth and those who dwell in it to worship the first Beast, whose mortal wound was healed." If the mortal wound was healed in mid AD 69 (which we saw that it was last week), and if verse 12 indicates they are worshiping a post-revival Roman empire or emperor, then there is no way that you can place this beast in AD 64 or AD 66 as so many full preterists do. Secondly, notice that this beast exercises the authority of the first beast, and he does so in the presence of the first beast. We have already seen that the first beast was Rome as led by Titus in the land of Israel. So whatever is going on here has to be while Titus was in the land, but it also had to be after AD 69. So that narrows the events of at least verse 12 down to AD AD 69-71, when Titus returned to Rome, leaving the remaining conquest of the Jews to one of his generals. Look at verse 14. Notice the phrase in the middle of that sentence where it says that this second beast performs signs "before the Beast." Again, this narrows the time scale down to when Titus was present in the land. That is a very small window of time. These people must have done miracles in front of either Vespasian or Titus. And finally, look at verse 16. "And he causes everyone — both small and great, both rich and poor, both free and slave—to receive marks on their right hand or on their foreheads." There was a very small time window in which Jews ever had this done to them. It didn't happen under Nero. It didn't happen when the empire fell apart between AD 68 and 69. It didn't happen at the time of the Bar Kockba rebellion in the second century. There was only one period in which this could have happened - AD 70-74. And it was done because the empire had fallen apart with divided loyalties and legions fighting legions. So in order to consolidate the empire, Titus enforced loyalty oaths everywhere, and in Israel it was enforced with particular rigor. This happened in other parts of the empire in AD 70-71 and in Israel between 70 and 74. So this is yet another confirmation that verses 11-18 follow sequentially after the events of verses 1-10. In effect they are expanding on what would happen during the forty-two months of war that had been authorized in AD 70. Well, if you take these timing clues at all seriously, you have to rule out most candidates because they were either dead or gone before AD 70 or they only start to be present after AD 74. So, for example, I think that Stuart Russell is wrong when he says that this is either governor Albinus (who was kicked out of office in AD 64 - way too early) or governor Florus, (who was kicked out of office in AD 66 - still too early). They were indeed wicked men who ruled Israel, but they don't fit the time sequence. And I would think you would have to rule out interpretations that make this hundreds of years later. The timing pretty much settles the identification. But who was this beast? Well, he is called a beast of prey just like the beast in verses 1-10 was, so we would expect that he is first and foremost a demon. And the unusual language of verse 1 seems to confirm this. Verse 1 says that this beast comes up from under the land of Israel. It says, "Now I saw another beast of prey coming up out of the land." The Greek word for "coming up" is ἀναβαίνω, which the dictionary defines as "to be in motion upward, ascend" (BDAG). When any rational being comes up out of the earth in the Bible it is a reference to someone coming up out of Hades or the Abyss, which is in the heart of the earth. So for example, 1 Samuel 28:13 says of Samuel's spirit, that it was "a spirit ascending up out of the earth." And later that is specified to be Sheol. Likewise, Daniel 7:17 has the demonic beasts arising up out of the earth. And since exactly the same Greek word is used in other parts of Revelation for other demons arising from the Abyss, we have an immediate hint that this is a demon. It is not just out of the earth, but arising upwards from out of the earth. Of course, what is hinted at here is made explicit in the rest of this chapter when the beast is able to perform these amazing demonic deceiving miracles. Where does he get that power? If it's not from God, it has to be from demonic power. And it is made even more explicit later in the book where the visible land-beast is three times called a false prophet. Talmudism must be seen as a false prophet. There is no Judeo-Christian consensus. That is a myth promoted by dispensationalism. The more you read of the Talmud, the more you realize that it is a major divergence from the Old Testament. I joked with a rabbi friend of mine one time that I was more of a Jew than he was because I followed the Old Testament and he did not - he frequently violated the Old Testament. His immediate response was to say that Judaism is defined by the Talmud, not by the Torah, and where the two diverge, the Talmud always trumps the Bible. So one application of this passage is that Talmudism must be seen as a false prophet. In any case, most commentators connect the false prophet of chapters 16, 19, and 20 to either the beast as a whole or to one of these horns. And so it is significant that the false prophet has demonic frogs coming out of his mouth in chapter 16 in the same way that demonic frogs come out of the first beast's mouth and out of Satan's mouth. That is imagery to say that the demons behind these two horns have inferior demons at their command. It hints at a hierarchy or pecking order among demons. So I think it is fairly clear that like the previous beast, this beast is first and foremost a demon who comes up out of the Abyss, and the two horns are first and foremost demons. But just as the first "beast" and ten horns represented both demons and the rulers and kingdom that the demons controlled, we would expect the same to be true here. And it is. This becomes very obvious in verses 12-18 where the demon is clearly working through a very visible human to persuade other very visible humans to do something. In a bit we will see that this human is Herod Agrippa II. But based on the usage of the term "beast" in the first half of the chapter, we would expect the demon to be behind a human king with a human kingdom just like the previous beast was. 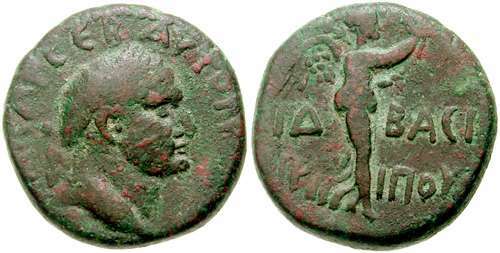 And just as Nero and Titus were heads of the previous beast of prey (Rome) Arippa was the political head of this beast of prey (Israel). All the other leaders were pretty much killed off or sold into slavery. And the Greek word for "the earth" here is τῆς γῆς, confirming that the kingdom is Israel. This term is used throughout Revelation in the style of the Hebrew phrase, ha aretz (הָאָֽרֶץ), "the land," which is a reference to the land of Israel. So though the first beast came up out of the Abyss from the Western region of Rome, or the sea, this beast came up out of the Abyss in the region of the land of Israel. The location where he comes up likely references where he will be allowed to rule. And that phrase, "the land," is repeated in verses 11, 12, 13, and 14. These clear references to Israel rule out any candidate that only fits Rome or Rome's religion. And besides that, Rome's religion did not have a deceptive appearance of a lamb. It wasn't pretending to be Biblical. And for that matter, Rome's religion was not imposed on Israel. The only thing that was imposed on Israel was obeisance to Titus and calling him Lord and wearing His name on their hands and foreheads. Rome was quite tolerant of all religions, so long as those religions acknowledged Caesar as Lord. And Talmudism did so. Well if the beast as a whole represents the kingdom controlled by the demon beast, and if the head represents the political ruler, then the only candidate king that fits is Herod Agrippa II - and he fits perfectly. So the visible kingdom of the demon beast is Israel and the visible king of the demon beast is Agrippa. Let's talk about him. Herod Agrippa II was a Jewish king who was the great grandson of Herod the Great. He was a client king of Rome, and so he exercised the authority of Rome. All the way along he was totally loyal to Nero and then to Vespasian and then to Titus. But he was a Jew. Surprisingly , in AD 70, though a practicing Jew, he started to put blasphemous images of Rome on his coins, no doubt because asked to do so by his friend, Titus. He fought side by side with Titus and went to Rome to receive the honor of praetor for his efforts in the war and to receive additional territory to rule. In other words, he is integral to the story that John is telling. His sister was Berenice, the mistress of Titus. Agrippa was a very close friend with Titus. He was also a close friend of Josephus. In fact, Josephus constantly rode with Titus and with Agrippa and served their every need. So Agrippa II was the head of the beast of prey, Israel. He pretended to be a lamb-like devotee to Judaism, but it is obvious that he was a tool of Rome and of the devil. The next clue is given in the second half of verse 1. "and he had two horns like a lamb and spoke like a dragon." A beast of prey with horns like a lamb sounds very similar to Christ's warning about false prophets who would be wolves (those are beasts of prey) in sheep's clothing. And since we already saw that horns were demons working through leaders, we expect the demonic to be present in whoever these horns speak about. And this is doubly so since the clause also speaks of the beast speaking like a dragon. That is the second hint that demons will be speaking through Israel's leadership. So right off the bat we get the impression that Agrippa II (the head) will have two false prophets who will do the miracles and deceive the people. And that is exactly what we find in history. The two key Jewish prophets who worked hand-in-hand with Herod Agrippa II as well as serving Titus' every wish were Josephus and Yohannan. Let me give you a bit of background on why God would consider these two to be demonic leaders. First of all, Josephus was one of the ten generals of Israel's armies at the beginning of the war. He fought valiantly against Rome. So it is a surprise to see him do a complete reversal after he was captured. But if this demon took hold of Josephus at that time, you can understand it. And Josephus actually credits his reversal of policy to several terrifying visions he had that told him to. I believe they were demonic visions, but he followed them. From that point on Josephus became totally devoted to Rome and best friends with Titus. Was Josephus a prophet (as per 13:11; 16:13; 19:20 and 20:10)? Yes. When Josephus first made his prophecy that Vespasian would become emperor, Vespasian was understandably wary that it was a ploy by Josephus to save his neck. It was only after Vespasian questioned other Jewish prisoners that he became convinced that Josephus really did have prophetic abilities. Vespasian was a hardheaded military man; he was not the kind to be taken in by a trick. Upon learning that Josephus truly was a prophet, Vespasian spared his life. Josephus became especially close with Titus. His dedication even led him to take on the Flavian name, thus he became Flavius Josephus. So Josephus considered himself to be a prophet and to receive revelations from God. ... the prophecy was undoubtedly messianic, Josephus, when he mentioned it in his book, added that the Zealots interpreted it as a reference to the Messiah... Josephus [was] expanding the prophecy... [and] attributed to himself the qualities of a soothsayer. Josephus himself calls his dreams "terrifying images," and Cornfeld says that he "was obviously beset by such fears in his wakeful hours as well." He really appears to have been distressed by a demon. The Roman historians Suetonius and Tacitus both speak of demonic prophecies in other parts of the empire that said that the next emperor would come from Judea, and those prophecies are almost identical to Josephus' prophecies. From all over the empire Satan is orchestrating events to get Vespasian on the throne, and he uses pagan prophets and two Jewish prophets to do so. So Josephus fits the false prophet who is clothed in sheep's clothing (in other words, Biblical clothing) but is a ravenous wolf. He worked hand-in-hand with Agrippa II, Titus, and Yohannan in getting Israel to make revolutionary changes in Judaism and to convince the people to give dual loyalties to Caesar and to God. Rabbi Yohannan ben Zakkai is the other horn who will be coming up later in this book. Both of these men would have been well known by any Jewish Christian who read the book of Revelation in the first century. It was due to both of them that the Jewish church was so persecuted in the first and second century. Talmudism is virulently anti-Christian. So let me tell you about Yohannan. Yohannan Ben Zakkai has been considered by Judaism to be one of the three greatest rabbis of all history, with his mentor Hillel being the first, and Rabbi Akiva being the third. His influence for collecting the data that would later become the Talmud was foundational for Talmudism. Talmudism would never have happened without him. Where Josephus was able to connect with the common man, Yohannan was the academic; but both he and Yohannan were committed to Pharisaism and represented the rabbinic interests. He founded a rabbinic school in Yavneh with Titus' permission to promote the radically anti-Christian teachings that became recorded in the Talmud. And if you have never read the blasphemies against Jesus that were written by that man, think yourself blessed. I was ill to my stomach when I read these demonic writings. I cannot conceive of any more perverted or hateful statements than those that he wrote about Jesus. Now, I have to tell you these things because you are not as familiar with these two men, but first century Christians would have instantly made the connection. Let me tell you a bit more about Yohannan that will be essential to interpreting the later verses. He too was acclaimed as a miracle working prophet by the Jews. The famous Hillel was said to have prophetically conferred the transmission of the traditions of the fathers to Yohannan as the next prophet. And both seemed to have supernatural abilities to handle these materials. They must have had almost photographic memories. The Jewish Encyclopedia references Yohannan's prophecies, including a prophecy that Vespasian would become the emperor, just as Josephus had previously done. He taught occultism and Qabbalistic trances. Yohannan first, assumed the liturgical authority formerly vested de facto in the Temple priests to determine the proper calendar. Second, he exercised judicial and legal authority earlier held by the Sanhedrin in Jerusalem. This was a radical change. So verse 11 is the newly emerging Judaism with its demonic influence, its political leader Agrippa II, and its two defacto spiritual leaders, Josephus and Yohannan. By AD 70, there was no other surviving leadership. The whole leadership of Israel was in the pocket of Rome and the first demonic beast behind them. This was a conspiracy between two demons who were able to accomplish through these men the things that are now going to be listed in the remaining verses. And for those who are skeptical of the miraculous being able to work through unbelievers, just consider the fact that when Moses performed his miracles, the demonic witchdoctors of Pharaoh were also able to perform many of those miracles by their demonic powers. Demons can do miracles. Don't trust a person just because he is doing miracles. We saw witchdoctors in Ethiopia do amazing miracles. Satan imitates everything God does. The text of Exodus does not say that those magicians pretended to do miracles. It says that they actually were able to produce those miracles. Well, the same is true here. He actually went so far, after the capture of Jotapata, as to deliberately invite Vespasian and his army to his capital, to celebrate the occasion of the conquest of the Jews. The drunken festivities and unrestrained debauchery that ensued lasted for three weeks. He then joined the conquerors in their victorious march onward. So full-hearted was Agrippa in carrying out Titus' wishes, that he was granted new territories after the war. Indeed, he played a key role in getting Vespasian and Titus on the throne. Titus specifically conscripted his help to get his dad on the throne. So this is just another way in which you see the demons of Judaism and Rome working hand in glove. For the past two hundred years there had been a controlling interest of Talmudism and the bankers with Rome. His dad, Herod Agrippa I had crowned a previous emperor, Claudius, and that crowning is recorded on coins. But verse 12 goes on to say that he exercises this authority "in his presence." Only two Jewish characters were constantly in Titus' presence throughout the war: Agrippa, the head of the beast, and Josephus, one of the horns of the beast. The other horn was an academic who worked behind the scenes. He starts to cause Israel and its citizens to worship the first beast (Rome) whose mortal wound was healed (v. 12c). Note this implies he hadn't been doing that before. The next phrase says, "and he started to cause the earth and those who dwell in it to worship the first Beast, whose mortal wound was healed." Note the phrase, "he started to." Prior to this time Agrippa did not bother enforcing emperor worship, even though he was supposed to. And certainly Josephus and Yohannan were not involved in doing so. Prior to this time Agrippa's coins do not reflect emperor worship. Instead, his actions were supportive of Judaism. He was a Jew. He read the Bible, insisted on circumcision for those who wanted to marry his sisters, etc. But once he was possessed by this land-beast demon, things immediately changed. He immediately began to enforce what the Jewish Encylopedia calls "blind submission to the emperor." Even the stamping of his coins shows a change. 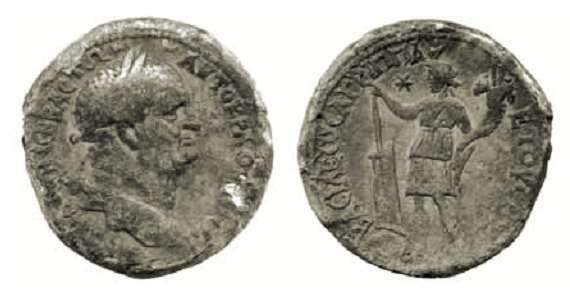 From the time he was possessed in AD 70, he started minting coins with the emperor on one side and a god or godess of the Romans on the other side. In your outlines are two coins during the Vespasian era with the goddess Tyche on one side, and another Titus coin with the god Nike on the other. And there are others coins with the God Pan. So our view takes seriously that phrase, "he started to." This worship of the emperor was enforced through the end of the war. Last week I read a gruesome report of how Titus' representatives tortured six hundred Jews because they were not willing to call Caesar Lord. And Josephus records it without too many qualms. After all, he himself had been involved in torture of Jews. But this was a recent development. Previous to this Agrippa had actually protected Christians in Pella, and had stood up for Jews on the issue of emperor worship. But no more. Historians credit this simply to Agrippa sparing his own neck, but the record shows that he enthusiastically enforced submission to Titus. I think there was a demonic presence there. But of course, the beast isn't just Agrippa. It is also the horns. And it is the change that came over Josephus and Yohannan that I find to be the most astounding. Everyone agrees that Josephus and Yohannan were dedicated to Judaism and thought it was blasphemy to worship anyone but the one true God. So one wonders how they were able to take an oath of loyalty to Caesar, to call him lord, and to bow before his image. That seems incompatible, yet they were quite willing to do so. Josephus and Yohannan both felt that it would be suicidal to not call him lord, and they did everything they could to get Israel to not commit the sin of suicide. And by that they mean, "Just take the pledge and call Caesar, Lord. It's not a big deal." Josephus gives his rationale for honoring other gods when he says this: "Our Legislator [referring to God] has forbidden us to laugh at or blaspheme those who are considered gods by others on account of the very name of God given to them." (Apion 2:33-34.) That's weird. But his logic is that if God forbids us from laughing at or blaspheming other gods because the word "god" is used, it is OK to honor them, while in your head still worshiping only the one true God. It seems like a pretty lame excuse, but you can see him trying to have his cake and eat it too. But it is Yohannan who takes the rationalizations to a very sophisticated degree. It makes my head hurt when I read his rationalizations of why it isn't idolatry to go through the loyalty ceremonies of Caesar. Yair Furstenberg wrote a very tedious essay called "The Rabbinic View of Idolatry and the Roman Political Conception of Divinity." In this article he teases apart the detailed rationalizations of rabbis like Yohannan on how you can technically be involved in idolatry for economic reasons, yet personally reject it and not be guilty of it. It's kind of like having crossed fingers. For example, he said that if you know the Gentiles themselves don't consider the image to be an idol, then you aren't committing idolatry when the emperor forces you to honor it. So both Josephus and Yohannan used sophisticated rationalizations for getting people to be involved in what we would consider flat-out "worship of Caesar." But the average Joe Bloe would have been totally lost with all of that argumentation. I was sometimes lost. So to get the average Joe Bloe to go along with Caesar's demands, the beast also performed great miracles through Josephus and Yohannan. Verse 13 says, "And he performs great signs, including that fire should come down from heaven upon the earth before the people." Is there evidence that any of the three men moved by this beast performed miracles? Yes there are, including the miracle of calling down fire from heaven. As Eleazar ben Arach began to expound upon the subject, "Fire descended from heaven and enveloped all the trees in the field, which broke forth in song." Notice the phrase, "Fire descended from heaven and enveloped all the trees in the field." And that fire from heaven was supposed to be a proof that this occult mysticism was OK. If Yohannan did that once, could he have done it again? I don't see why not. In any case, you can see how miracles like this would have duly impressed the Jews into agreeing with his rationalizations. "Hey, if God does such miracles through him, maybe we can trust his reasoning and give a pinch of incense to Caesar. After all, it's just a token. And without it, we won't be able to engage in economic transactions." That was a very impressive miracle. And as I said, the Talmud ascribes many miracles to him. As the exorcism happened and the water basin was flipped over without any human being near it, Vespasian and others were impressed. I won't take the time to document other miracles that were performed on behalf of Agrippa and Titus in order to get people to worship. Suffice it to say that the two horns were masters at deception. They were prophetic wolves in sheep's clothing. And they succeeded in getting many Jews to go along with this new Talmudic reasoning for honoring Caesar. Those who refused, died. Verse 14 says, "And he deceives my own people, those dwelling on the earth, by the signs that it was given to him to perform before the Beast..." To get both the warrior Josephus and the pacifist Yohannan on board with this emperor worship was an incredible deception. But to get hundreds of thousands of Jews to give an oath of loyalty and bow before the image is astonishing to me. But the fact that hundreds of thousands of Jews survived and continued to occupy the land with full approval of Vespasian and Titus is tribute to the success their astounding demonic work. Vespasian and Titus did not consider Talmudism to be a threat to statism. Christianity was, but not Talmudism. The Zealots were, but not Talmudism. What stood behind Rome and Talmudism was the same demonic kingdom. But notice that they went beyond worship. The beast got them to make an image. Verse 14 goes on to say, "telling those who dwell on the earth to make an image to the Beast who had the sword wound and lived." I believe it was Agrippa as head of Israel who gave these orders. He certainly made images of Caesar and of gods. He did this on coins. But John Wilson's book on archeology points to two statues that Agrippa made for purposes of emperor worship, one an image of Pan and the other an image of Tyche. And of course, he minted coins to both of those gods. But this statue that Agrippa makes is somehow animated by a demon so that it actually talks. This seems so impossible to modern Christians that they come up with theories of ventriloquism, or priests speaking through tubes in the back of the image, or hallucinations. But that is not what the text says. This doesn't say that the beast faked this - as most commentators claim. Verse 15 says, "And it was granted to him to give breath to the image of the Beast, so that the image of the Beast should actually speak..."
Somehow breath came out of the image and speech came out of the image. I believe that God gave permission to this demon to speak through the image - something highly unusual. And the reason I say it is unusual is that Psalm 115 and other similar passages makes clear that normally God did not permit demons to speak through idols. But since it was granted to the beast to have this power, I believe this actually happened. And to skeptics who doubt that this could happen, I would point to the Greek historian, Plutarch, who lived during these times. In my reading of Plutarch I have found two separate occasions when Roman statues actually spoke - and startled those who were nearby. As a Greek historian he is rather skeptical of the reports, but he says that they were witnessed by many and that even the Roman Senate made the claim. Those two accounts were from a different era and different land, but if it could happen in Rome, why could it not happen in Israel in exactly the same way? My point is that secular histories don't make something true. They only record a tiny fraction of what happened. The text here is clear that the demon was allowed to make the image talk. And perhaps at some point we will find a historical reference to a statue in Israel talking. But we do have two occurences in Roman history of a statue being made to speak by demons. And finally, the land beast made sure that those who refused to worship the image of the Beast were put to death. Agrippa was definitely the first beast's enforcer. I already read you an account of how Israel's leadership (this beastial trio) captured six hundred Jews who refused to worship, and had them tortured to death, including women and little children. Every detail of this passage fits the events of AD 70 and following. And I have not read any other explanation that makes sense of the details. We will pick up with verse 16 next week. But let me end with some further applications of what we have seen so far. The first and most obvious application is that Christians must beware of what looks like Christianity because it is wearing sheep's clothing, but has the influence of the dragon about. Satan loves to cloak evil in legitimate garb. Sometimes he will use an honored figure like Josephus or Yohannan. These men were so honored as Bible scholars in Israel that many followed what they said blindly and were led into demonic doctrines. It's one of the reasons cults flourish. They mix enough good in with the error that the error may seem palatable. And they do enough loving things that people automatically buy into the whole package. But I have seen Satan using exactly the same strategy with evangelicals to lead people astray. Think of the countless numbers who have been led to embrace evolution because they like Tim Keller. "If Tim Keller thinks it's OK, it must be OK." Now, I am not saying that Tim Keller is the beast, but the same reasons for overlooking error that were happening with Yohannan can also happen with evangelicals. Scripture holds us teachers to a much higher standard and says that we will receive a much more severe discipline if we lead our flocks astray. And I believe men like Tim Keller have led countless people astray into Socialism, Feminism, and other serious error. Sure, they may have far more sheep about them than just a couple of horns, but socialism, feminism, and evolution are doctrines straight from the pit of hell and they should not be swallowed simply because of the stature of the teacher. And again, I am not calling Tim Keller a non-Christian. He would actually be far less dangerous if he were not a Christian. I am just pointing to a strategy that demons use to deceive. They will speak error through a leader. That's why I always insist that you not believe something simply because I teach it. You must be Bereans who search the Scriptures daily to see if these things are so. The second application is that we need to be on guard against our own rationalization. Josephus and Yohannan were under enormous economic pressure to bow to Caesar and call him lord. Their economic livelihoods were on the line. And even though their rationalizations look silly to us looking in from the twenty-first century, the rationalization made sense to them because they wanted to be convinced of a way to compromise. And in the same way, we can easily rationalize when we are in the thick of pressure. But since Christians should want to avoid all deception and given no legal ground to Satan, we should pray that God would keep us from all rationalization. Think of it this way: if even pastors can rationalize a belief in evolution, or statism, or welfare, or feminism, or other modern issues and still claim to be faithful to the Scriptures, you know it is easy for any of us to rationalize on smaller things. The third application is that you should not assume that because a leader can do miracles that his message is sound. I believe in miracles, but Biblical truth must trump everything else. Nothing but the Bible is infallible. And I know pastors who do miracles, yet they deny the doctrine of justification by faith alone and deny the inerrancy of Scripture. When I told one of those pastors that I could no longer treat him as a Christian because of his heretical gospel and his heretical view of Scripture, his response was to say that God must have no problem with his doctrine because God had healed people through his prayers. Can you see the problem with that reasoning? Their miracles do not justify their heretical doctrine or the miracles of Josephus and Yohannes would justify Talmudism. Too many people get confused on those subject. Even demons can do miracles. James 3:13 Who is wise and understanding among you? Let him show by good conduct that his works are done in the meekness of wisdom. 14 But if you have bitter envy and self-seeking in your hearts, do not boast and lie against the truth. 15 This wisdom does not descend from above, but is earthly, sensual, demonic. 16 For where envy and self-seeking exist, confusion and every evil thing are there. 17 But the wisdom that is from above is first pure, then peaceable, gentle, willing to yield, full of mercy and good fruits, without partiality and without hypocrisy. 18 Now the fruit of righteousness is sown in peace by those who make peace. Those are the only two alternatives - not just for wisdom, for all of living. To live by power from below or to live by power from above, where Christ is. May our vision be fixed on Jesus who is the author and finisher of our faith. Amen. Dunn describes Yohanan ben Zakkai as the one “who played the leading role in establishing the rabbis as the main power brokers within Israel and began the process of reconstituting Second Temple Judaism as rabbinic Judaism.” J. D. G. Dunn, “The Embarrassment of History: Reflections on the Problem of ‘Anti-Judaism’ in the Fourth Gospel,” in Bieringer et al., Anti- Judaism and the Fourth Gospel, 47–67, esp. 52–53. The full text is as follows. "The senate, much commending their public spirit, caused the temple to be built and a statue set up in it at the public charge; they, however, made up a sum among themselves for a second image of Fortune, which the Romans say uttered, as it was putting up, words to this effect, "Blessed of the gods, O women, is your gift." "These words, they profess, were repeated a second time, expecting our belief of what seems pretty nearly an impossibility. It may be possible enough that statues may seem to sweat, and to run with tears, and to stand with certain dewy drops of a sanguine colour; for timber and stones are frequently known to contract a kind of scurf and rottenness, productive of moisture; and various tints may form on the surfaces, both from within and from the action of the air outside; and by these signs it is not absurd to imagine that the deity may forewarn us. It may happen, also, that images and statues may sometimes make a noise not unlike that of a moan or groan, through a rupture or violent internal separation of the parts; but that an articulate voice, and such express words, and language so clear and exact and elaborate, should proceed from inanimate things is, in my judgment, a thing utterly out of possibility. For it was never known that either the soul of man, or the deity himself, uttered vocal sounds and language, alone, without an organized body and members fitted for speech. But where history seems in a manner to force our assent by the concurrence of numerous and credible witnesses, we are to conclude that an impression distinct from sensation affects the imaginative part of our nature, and then carries away the judgment, so as to believe it to be a sensation; just as in sleep we fancy we see and hear, without really doing either. Persons, however, whose strong feelings of reverence to the deity, and tenderness for religion, will not allow them to deny or invalidate anything of this kind, have certainly a strong argument for their faith, in the wonderful and transcendent character of the divine power; which admits no manner of comparison with ours, either in its nature or its action, the modes or the strength of its operations. It is no contradiction to reason that it should do things that we cannot do, and effect what for us is impracticable: differing from us in all respects, in its acts yet more than in other points we may well believe it to be unlike us and remote from us. Knowledge of divine things for the most part, as Heraclitus says, is lost to us by incredulity." Arthur Hugh Clough and Plutarch, Plutarch: The Lives of the Noble Grecians and Romans, trans. John Dryden (New York: Modern Library, 1932), 288-299, http://www.questia.com/read/81003577/plutarch-the-lives-of-the-noble-grecians-and-romans.